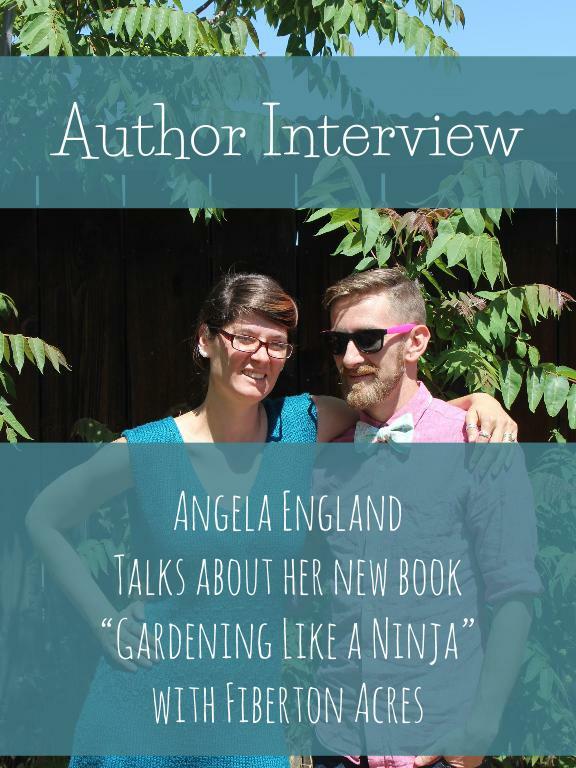 We are so excited to present to all our awesome readers Angela England, homesteader, small biz guru, blogger, green thumb and book writer! 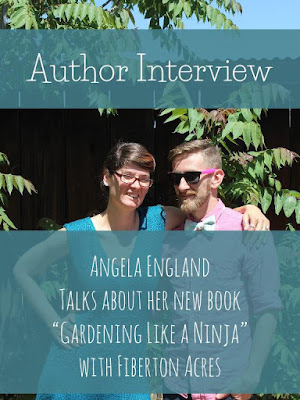 She just released her new book, Gardening Like a Ninja, which is basically a must-have for all urban dwellers, landscape enthusiasts, or foodies! In this book, Angela addresses an issue that I think a LOT of people run into, especially in the city - aesthetics of having a food garden. She shows us in very real way not only how to make your space look beautiful while sneaking in edible plants, but also talks about how to do so in a variety of spaces, big and small. There are wonderful before and after photos, as well as illustrations of how and what to plant in the little side yard or your blasé front lawn. It also features original water color illustrations in Part 2 which are done by the incredible illustrator Wendy Piersall. See her lovely work at http://www.wendypiersall.com. We were very fortunate to get to ask her some questions about her new book, and here is what we learned! Ashley from Fiberton: Hi Angela! Thanks so much for chatting with us! 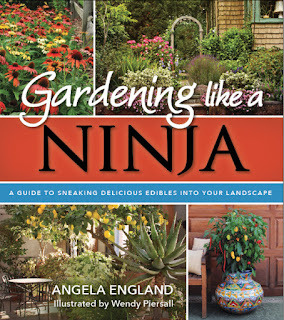 We LOVE the new book, Gardening Like a Ninja! I know you talk about it in your forward, but can you tell our readers a little about how this book came to be? Angela: When I wrote Backyard Farming on an Acre (More or Less) I wanted to show people that they could start producing their own food in even the smallest of garden spaces. 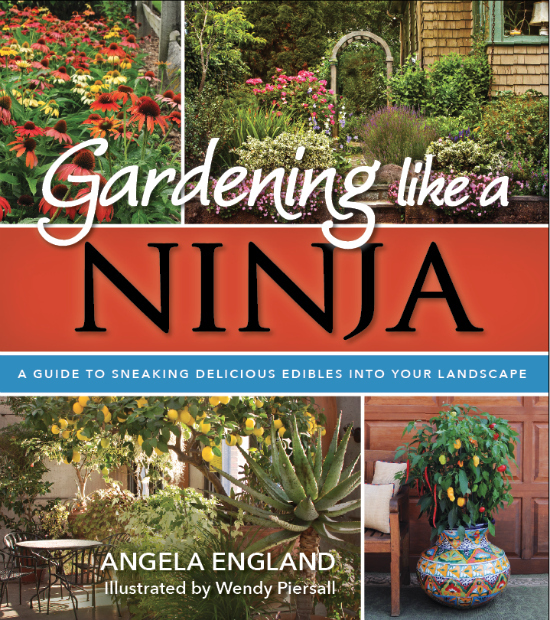 One of the sub-sections in one of the gardening chapters talked about edible landscaping and I used the phrase, "Now you're gardening like a ninja!" My publisher loved it and recommended that I pull that topic out as a stand alone book. As more and more readers gave me the feedback "I love the idea of homesteading but my HOA won't let me." or "I'm renting so I can't keep a veggie garden but my landlords will allow general landscaping - tips?" I realized that there is a true need for this book. Ashley: How long have you been gardening/homesteading? What inspired you to share your knowledge? Angela: I began a journey towards self-sufficiency when I married my husband. The more we researched what was available for our children the more we realized we really wanted to have a better say over the food we were feeding our kids. Which for us meant producing a great deal of it ourselves! I love when I sit down to a meal of salad, steak, and potatoes and everything on the plate came from our home. As I began talking to other beginners and dreamers I realized that many of them felt if you didn't grow up in that lifestyle, there was nothing you could do. But that simple isn't true! I didn't learn how to grow veggies of my own until I married and pregnant with my first child! And I'm quite the most dis-organized person I know...if I can do it, anyone can do it. Ashley: Even though I am no longer a city dweller, I still love the idea of making my garden space Secret Garden-esque, which is what I feel like when I read through your book. (I also remember having to deal with making a nice looking yard when I was in the city.) I think your book gives us all the tools to tackle these kinds of projects, but that must have taken quite a bit of time and research. What was the most challenging thing you encountered working on this project? Angela: It actually took a higher level of research to write this just-under-200 page Edible Landscaping guide than it did to write the 430 page Backyard Farming book. When I was working on this book there were several challenges that I had to keep in mind. 1. Climates and Zones - I live in Oklahoma so the plants I am most familiar with are the plants that grow in my gardening zone. However, I grew up in California so I know there are many plants available to garden ninja that extend far beyond my own zone. I made it a point to include example gardens from a variety of zones and growing conditions so you'll see everything from a tropical porch with lush citrus trees, to a gorgeous New England style home that has a much colder climate to deal with. It was important to me that ANYONE be able to open this book and find a plant relevant to their area. 2. Edible Landscaping Rockstars - Not every edible plant is really a great choice for an edible landscape. So when I make suggestions, say about climbing beans up a trellis to add a vertical accent, I wanted to offer ideas for which beans. Many beans are perfectly edible but plain green pods and plain green vines with plain green leaves. Nothing particular special. However, some varieties have pale white or yellow pods that would shimmer in the sunlight. Others have burgundy tones through the stems, leaves and pods. Others are variegated and spotted and speckled. So that research and talking with nursery owners and plant breeding companies to find specific plant recommendations took a tremendous amount of time and research. 3. Photos - As I said I like in Oklahoma. We don't have a wet enough climate for some of the beautiful coastal garden looks and we don't have a warm enough climate for some of the amazing tropical plants available in zones 8 or 9. So I had to source photos of plants I didn't have or couldn't fine the perfect photo of and that took some time as well. Ashley: And what was the most interesting thing you learned while doing your research? Angela: It was really interesting to me how many of the common plants that are now used primarily as landscape plants were originally developed as edibles. Hostas, for example, had been grown for their spring shoots. Now, of course, they are a staple in the shade garden landscape. Recapturing some of that lost knowledge was one of the coolest things to me about writing this book. Ashley: We hear you are planning on doing a course to accompany the book. Can you tell us more about this? Angela: Lots of times what I hear from readers is that they want a way to connect beyond the book. That's why I developed this course, to guide people through how to get started. The course will walk people through four units, each with three lessons, and really delve more in depth in some of the areas I didn't have room for in the book. For example how to do a simple soil test at home to determine your soil's composition. Unit four is probably my favorite because I walk people through the EXACT process I used to develop the seven original garden design plans that they find in the book. I develop a bonus plan - a full-sun front border - and as I build the plan I show step-by-step how it's done. They see how to draw the plants, even if you aren't an artist. The simple tools I use that you probably already have in your own (no pricey software required!). And at the end they get an exclusive full-color illustration from Wendy, just like the designs in the book! Ashley: We know you are always busy working on new projects. Anything else you want to share with our readers? Ashley: Thank you so much for taking time our of your busy schedule to share your book with our readers! We are super excited and can't wait to get our copy! For all our readers, you can order your own copy of the book and/or the course here on Amazon!